Enjoy a romantic flight with a loved one, give a flight as a gift for that special occasion, or take a flight because it’s what you’ve always wanted to do. 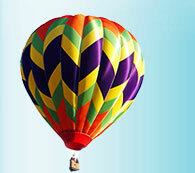 A hot air balloon flight is a perfect gift for the holidays, graduation, birthday, wedding or anniversary. Copyright © 2006 The Sky's The Limit Ballooning, Inc. All rights reserved.